Each year, the U.S. Forest Service selects a Capitol tree from a different national forest. Alaska had a chance to provide the nation’s Christmas tree once before: The 1998 tree was supposed to come from the Tongass National Forest. However, the Alaska Legislature protested because of how federal environmental policy was impacting the local logging industry. But in 2015, Alaska had another opportunity. 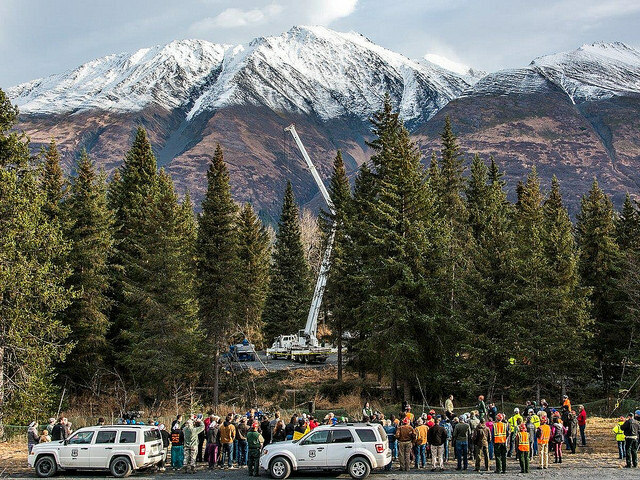 The 74-foot Lutz spruce, which is a natural hybrid of Sitka and white spruce trees, was cut October 27 from the Chugach National Forest. It traveled to Washington, D.C. first on cargo ship to Washington state and then by truck across the lower 48, arriving November 20. The towering spruce traveled with 75 companion trees – ranging from 8 to 25 feet tall – which are used to decorate congressional and administrative offices. Alaska Sen. Lisa Murkowski points out that Alaska residents have been choosing their own Christmas trees from the Chugach National Forest for years. Now, the nation gets to share in a special tree from a special place. The forest is the nation’s northernmost and includes several ecosystem types. It stretches from the sea to mountain ranges on an expanse of land the size of New Hampshire. The forest is a favorite of Alaska residents, who enjoy outdoor activities such as kayaking, fishing and hiking, as well as abundant wildlife viewing within the forest’s boundaries. The delivery of the national Christmas tree is a nationwide event, usually with frequent stops to display the tree to schoolchildren and local communities. The 2015 tree traveled more than 4,000 miles, a record for a Capitol Christmas tree journey. It stopped at more than a dozen cities, including Mitchell, South Dakota (home of the Corn Palace); South Bend, Indiana, for a winter festival; and Chillicothe, Ohio, home of the Kenworth Truck Co. that built the semi to haul the spruce across the country. The last stop before Washington, D.C. was at Joint Base Andrews in Maryland, where service members helped unwrap the tree to prep it for installation at its new home on the Capitol lawn. The People’s Tree was decorated with more than 2,000 ornaments made by Alaskan children and community members in conjunction with the Chugach National Forest and Alaska Geographic, who sought to develop ornaments that reflected Alaska’s natural beauty and cultural history. Ten Alaskan artists were selected to create ornament designs to inspire those kids and other residents in their projects. Make your own Alaska-themed ornaments! The tree will be lit on Wednesday, December 2 at 5 pm Eastern time. Watch the public ceremony on C-SPAN. You can visit the home of the 2015 U.S. Capitol Christmas tree yourself. The Kenai Princess Wilderness Lodge is a short drive from the Chugach National Forest, accessible by way of the scenic Seward Highway. Who knows? You might even have your photo taken with a future U.S. Capitol Christmas tree growing somewhere in your beautiful backdrop.